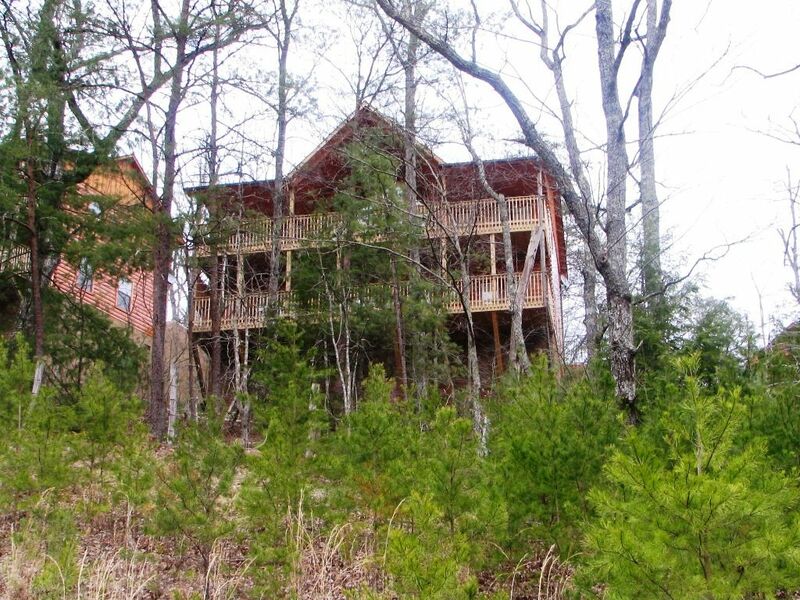 The Journey is a four bedroom, three and a half bath, Luxury Cabin located in Hidden Springs Resort just one and a half miles from Dollywood and Splash Country. The cabin is almost new and constantly upgraded. Hidden Springs Resort has a heated, covered swimming pool within walking distance of 'The Journey'. All bathroom floors in The Journey are constructed with ceramic tile. There is no sheetrock in our cabin and we have two separate heating and cooling units [w/separate thermostats] for both floors. WI-FI IS AVAILABLE THROUGHOUT THE CABIN. The main floor has a Great Room with a formal dining room table with ten chairs, and an island bar that seats two. We have just refinished the floors in the Living room area. The great room has a NEW 55 INCH FLAT SCREEN HD SATELLITE TV with 10 Showtime, 6 local channels,a DVD player, a new leather sectional consisting of a queen sofa sleeper two comfortable chairs. We have a stacked stone fireplace for your enjoyment on those cold or chilly nights. A half bath is located off the great room equipped with stacked washer\dryer. The Master Bedroom has a full bath, jacuzzi, king-size bed, four drawer chest, a NEW 32 INCH FLAT SCREEN HD SATELLITE TV and DVD player, along with access to the upper deck. The upper deck has four rockers and deck table with four chairs from which you can enjoy the splendor of the mountains. The lower level has game room with pool table,6 flat screen SCREEN TV, VCR, air hockey table, , and a radio w\cd player. Two full baths, three bedrooms, one with full bath, all w/king-size beds-gameroom equipped w/queen size sofa sleeper/all three bedrooms are equipped w/flat screen hdtvs king-size beds with four drawer chests. One of the bedrooms is a mini suite w/bath and the other two bedrooms share a bath. Lower deck has swing, four rocking chairs, hot tub, and table with four chairs. We think you will enjoy your journey to 'The Journey' and will want to return again and again!! The owners Jack and Chris grew up in middle Tennessee and currently reside in Ashland City TN. We have been involved in the real estate industry for about thirty eight years. Convenience of parking and driving to the cabin is an advantage for us over other properties. We are only slightly elevated from the main road coming in making the trip easy in any kind of vehicle. The pool is only a short walk from the cabin. We have two large decks equipped with snack table and chairs and rockers one of the decks also has an old fashioned swing for your enjoyment. It was great! Will be back. Easy to work with was great! Very easy dealing with management. Beautiful place. Great location. This cabin could be great with a little TLC. Pros: (1) It has plenty of space to accommodate larger groups, (2) Its in the mountains in a quiet resort but is just a short drive to Dollywood and Pigeon Forge so you get the best of both worlds; (3) The electric fireplace is cozy and a nice perk on cold nights. Cons: (1) It could use a good cleaning. The main cover on the overhead light in the kitchen had several cracks in it and was full of bugs, there was mildew buildup on the floor of one of the lower level bathrooms, and the lower level furniture and floors were pretty dusty; (2) Things are pretty worn out. The hot tub appears to be really old with weak jets, chunks missing from the padded headrests, and a tricky control panel. The vent registers in the bathrooms have chipped paint with exposed rust. Furniture is well used (I.e. missing handles on dressers, worn king mattress in front lower lever bedroom); (3) Not directly related to the cabin, the “heated” pool in the resort is just heated enough to check the box. We were really hoping to use it to entertain a kiddo, but it was too cold all 5 days that we were there. All in all, we had a nice stay, but I would recommend some attention and investment in the cabin. Also, we never had issues with the WiFi as mentioned in other reviews. The cabin is beautiful. Jack is great to work with. We had a bit of a challenge our first few nights because of the sofa bed mattresses. They are very old and really nothing but uncomfortable springs. That being said, Jack and I came up with a quick fix and he was a man of his word and helped us find a quick solution (air mattresses). It worked fine for us. I did however suggest that he replace the sofa bed mattresses. During our stay we had a few minor things to fix (light bulbs, water heater questions, etc) but Jack and his maintenance team were quick to respond/resolve the issues. Overall, this was a great stay and my extended family and I would rent from Jack again. This complex as a whole is amazing - this is not our first nor our last time staying at this resort. Easy to find, close enough to down but great to be away from the chaos. Swimming pool was nice too. Convenient location away from traffic. House was nice but needs updating. The sleeper sofa downstairs was in bad shape to sleep on, needs a new mattress, kids had to sleep with their parents. Same thing with the upstairs sleeper sofa. Bathrooms need updating. Toilet in one bathroom had issues with flushing, no hooks on the wall to hang your robe/clothes. Kitchen stove burners were very uneven, hard to cook on. These were the basic things, just needs upgrades for these problems and some of the decor.